Making soap at home is easier than you think! 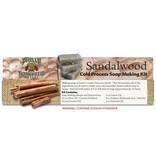 This kit contains all the ingredients you'll need to make your own beautiful, hand crafted soap at home. Each kit will yield a 3.5 to 4 pound loaf of soap (approximately 12 bars).